The host of the evening, Kevin Basl, began the night with an introduction to Warrior Writers (based out of Philadelphia) as well as Combat Paper NJ, a program of the Printmaking Center of NJ—two sister organizations that work with veterans through art, writing, and printmaking. Many of the readers that night were involved with both groups, participating in writing workshops, publishing work in the WW anthology, and pulping military uniforms to create paper that tells their stories. Both projects aim to create community through artistic expression. The most recent anthology of WW was also being sold for twenty dollars at the event, and many of the writers read their work from the collection. (Available through their website) Throughout the night, Basl introduced each reader (Walt Nygrad, Sarah Mess, James Yee, Frank Wagner, Jan Barry, Paul Rabinowitz) and then ended the evening with one of his own poems. The reading that night was certainly far from apathetic. Each of the six WW readers shared work with varying styles: some somber, others that joked, some rhyming, others using free verse. Regardless of style, all of the readers elicited a reaction from the crowd whether through laughter, an audible “wow,” applause, or that favorite poetry sigh that comes from the poems that give us chills. Moreover, the connections were not just from reader to listener—many of the readers referenced other writers or veterans in their work. Most opened or introduced a poem by discussing how other writers or soldiers pushed them to keep writing when they didn’t think they could or should. Sarah Mess dedicated two of her poems to other vets, one being Frank Wagner. Some people might assume these relationships occur in most veteran programs. Such bonds also occur in most (good) writing communities—making WW special in the sense that it joins the two but also no different from any other writing community that gives space, comfort, or constructive criticism to fellow authors. Writing about writing is another common trend that the two groups share. 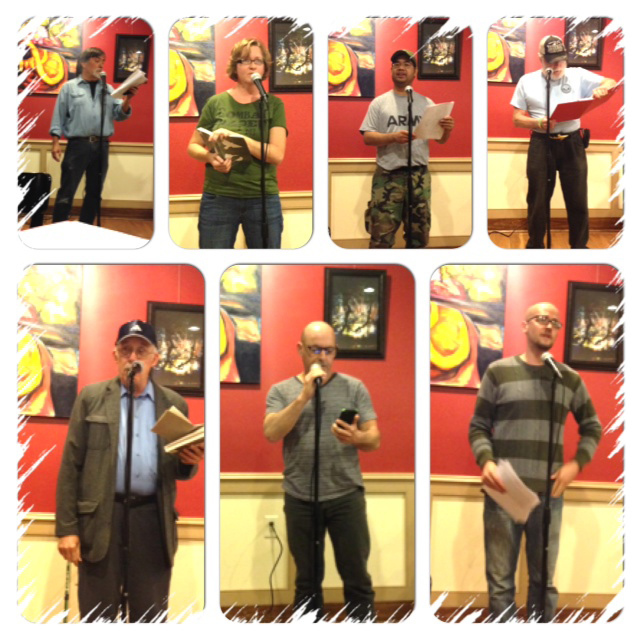 Many of the poets that night read works that discussed not talking about wartime experiences at first. Mess performed a poem about her “words march[ing] out” and that “their victory [was her] sanity.” She also commented on WW bridging the gap between vets and civilians through their readings and books. Nygard’s poem “How I Got Girls in Wartime” showcased the many cheeky lies he told about his escapades in the war but how he “never said a word about Vietnam.” Barry shared a poem about the common occurrence of suicide among vets, noting that he when he first wrote an obituary for his friend in the 70s, he wasn’t allowed to even mention suicide. Basl read a poem about a picture his parents keep of him wearing his uniform and how that didn’t seem like the full truth—similar to the war stories of Tim O’Brien. These poems give voice to the process of writing, particularly about writing on the complexities of war as well as the confusing return home from service. This sense community was further embodied in the establishment of the event itself that night. Rabinowitz first reached out to WW after meeting “the Warrior Writers at an art exhibit in Morristown. They were exhibiting art on their combat paper. [He] thought it was great and wanted to know more about the organization.” At the end of the night’s reading, Basl and others thanked Rabinowitz for the event and for sharing his own poems, “The Little Death” and “White Gun Powder.” Rabinowitz told Basl that he had never read the poem about the death of his friend before. Basl invited Rabinowitz to come to Warrior Writers workshops. This exchange is what both ABTP and Warrior Writers share—an acknowledgement that connection, especially through art, can be helpful or healing, but, most of all, it is human. For more information on Warrior Writers, Combat Paper or ARTS by the People, follow them on Twitter or visit their websites: ARTSbythepeople.com, PrintNJ.org/combat-paper/ and WarriorWriters.com. Be sure to also check out Warrior Writers at Dodge Poetry Festival in Newark this October from the 24th and 25th and ARTS By The People’s open mic series, The Platform, every first Wednesday of the month as well as their special edition of The Platform, Wednesday November 19th that will feature senior citizen writers, aged 65 and up.